We are always keeping an eye on market and customer demand at any time and changing our strategy according to it. We manufacturer, supplier and exporter the best quality Popping Boba Strawberry as well as prompt and satisfactory service according to the environment of the market and customer in Taiwan , which embodies our core value of customer centered and market-oriented on product quality. coated with smoothe skin, the feeling of strawberry sweetnesss flowing in your mouth enriched the flavor of all kinds of drinks. Either tea or fruit tea are compatible with it. 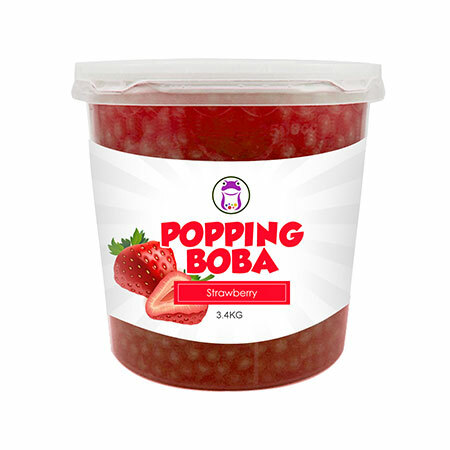 Put Popping Boba-Strawberry Flavor Coating Juice on the smoothie or snow ice, it also made the desserts more appealing visually and for taste. lifting the spirits and with lasting aftertaste. Popping Boba-Strawberry Flavor Coating is made of Strawberry Conc. Juice, suitable for various of drinks and as topping for frozen yogurt.